Download a blank fillable Dd Form 2831 - General Release Where Talent Fee Etc. Accrues To Participant in PDF format just by clicking the "DOWNLOAD PDF" button. Complete Dd Form 2831 - General Release Where Talent Fee Etc. Accrues To Participant with your personal data - all interactive fields are highlighted in places where you should type, access drop-down lists or select multiple-choice options. for the United States Government. 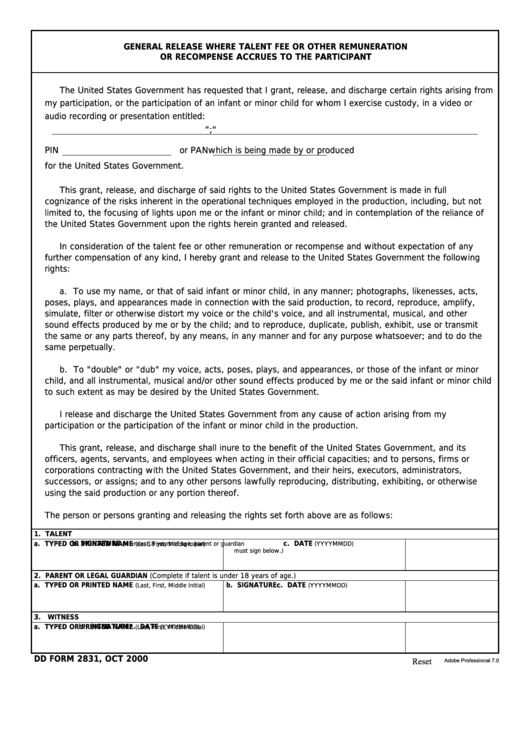 the United States Government upon the rights herein granted and released. to such extent as may be desired by the United States Government. participation or the participation of the infant or minor child in the production. using the said production or any portion thereof.